Attended Oak Park-River Forest High School in Illinois. Played college football at Notre Dame, but expelled by coach Knute Rockne for playing semi-pro professional football. 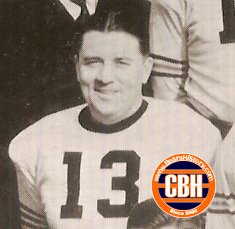 Played center and defense for the Decatur Staleys and Chicago Bears from 1920-21 and 1922-32. Six time all-pro selection. Famously was thrown the day's receipts on the final play of the Staleys' first visit to Rock Island in 1920 and carried money straight to the train. Coach of Winnipeg Blue Bombers of the CFL from 1951-1953. Died on September 5, 1971 at age 74. Enshrined in Pro Football Hall of Fame in 1964.